Our Rocking M Media High School Football Tour comes to a close. 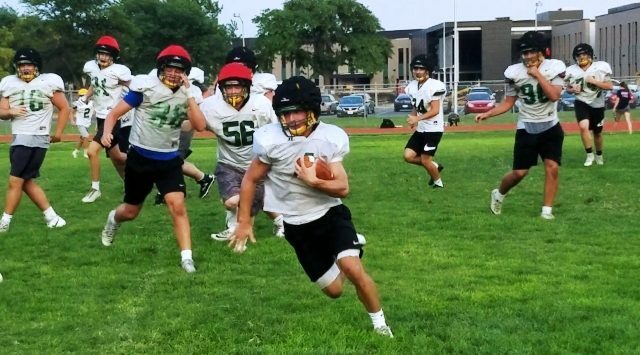 Every day this week, the staff at KSAL Sports is previewing the 2018 season, venturing to different parts of central Kansas. The latest stop was at Salina South High School, home of the Cougars. After a one-win campaign in 2016, the Cougars took a step forward last year. South handled Campus 42-12 in week three and later defeated Central for the seventh consecutive season. South’s biggest victory took place in the opening round of the Class 5A state playoffs when the Cougars traveled far to Liberal and returned with a 24-14 victory. Even against Eisenhower in the following round, South competed, but ultimately fell short, 20-6. Sam Sellers enters his ninth season as head coach with plenty of returners on both sides of the ball. Defense has the potential to be stout in 2018, led by an impressive duo on the defensive line. Senior Isaac Mitchell impressed many collegiate recruiters this offseason, pulling in offers from Air Force and Missouri Western State. Jayden Miller, Mitchell’s counterpart, blew up the middle of many offensive line last year, and the combination of the two should pave the way for a great season. The secondary has everyone back in senior Cai Calvert, junior Colby Bulleigh and sophomore AJ Johnson. The trio worked extremely hard this past year and should take the next step in 2018. South took a blow at the linebackers position, but Luke Streit is ready for his senior campaign after having a 70-tackle season. Offensively, South has the majority of its offensive line back. Karter Granzella, Spencer Einhaus and Nolan Cox lead the charge during their senior season. Junior Zach Isaacson took over late in the season as a starter. The group is prepared to create space for senior Kyle Quill, who spent time last year at wide receiver. Quill put on 30 pounds in the offseason, but still has the agility to be an explosive back. Starting quarterback Casey Lanoue graduated after picking up over 1,000 total yards. Junior Ty Garrett can play that position, but he plans to stay on the outside to be the main wide receiver. Sophomore Terran Galloway is ready to be the main signal caller. Last year, Galloway broke his leg, but the dual-threat quarterback is mentally prepared to be the QB. Follow the Cougars all season long with live play-by-play coverage on Y93.7, ksal.com & the Rocking M Media app.